It’s a bird! It’s a plane! Close, it’s a drone! Uses for drone are limitless and some inspectors have incorporated the technology in their work. Gingles Inspections uses a drone at home inspections under certain circumstances. When is the drone used? The inspector makes attempts to walk the ridge line of the roof. The inspector may not be able to do this in the event of inclement weather, roofs that are too steep to safely climb and/or roofs that are not accessible with a normal sized extension ladder. The drone can be used to inspect the condition of the roof coverings, look for defects, or look for damage and is used to inspect chimney’s, gables/eaves, penetrations, or other features of the structure that are hard to access or inaccessible by a normal sized extension ladder. Can the drone see everything? 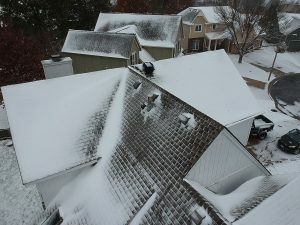 In the event of inclement weather such as snow or ice, the inspector will use the drone to get an overhead view of the roof system and penetrations. Snow or ice accumulation will limit the inspection greatly. 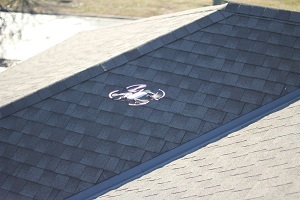 In the instances the inspector uses a drone to inspect the roof, the inspector will also inspect the roof at the eaves via a ladder to look at details such as flashing, underlayment, roof material condition, gutter condition, nailing, or other details that may be accessible at this area. ­Are there instances the drone cannot be used? In some instances, the operation of the drone may not be allowed. Gingles Inspections will operate the drone in accordance with the FAA regulations. 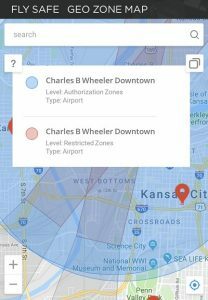 The proximity to restricted air spaces or a temporary flight restriction due to national/local security or VIP’s will prevent us from flying the drone. Other factors that effect the maneuverability of the drone such as excessive winds, extreme cold, dense vegetation/trees or nearby overhead lines may prevent us from using the drone.